Guess who's coming to Ft. Sill!! 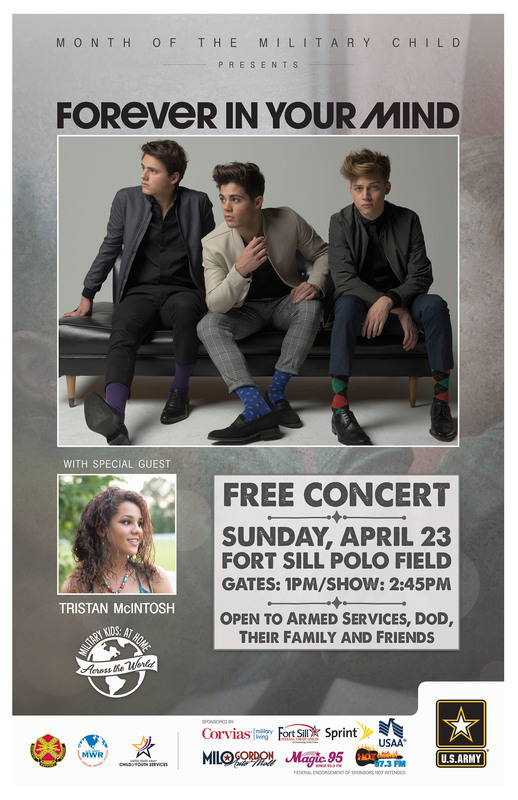 Sunday, April 23rd #ForeverinYourMind will be at the Fort Sill Polo Field. The concert is FREE and gates open at 1 p.m. There will be lots of kid-friendly activities until the concert begins at 2:45p.m. Be sure to check out the food and beverage vendors! No outside food and/or drink is allowed. (Water to mix formula, baby bottles, etc. are allowed). Bags may be searched at the gates for the safety of attendees. Attendees are encouraged to bring lawn chairs and blankets for seating and sunscreen or umbrellas for sun protection.